For many people with HIV, antibiotic-resistant staph infections can turn deadly but this new treatment may actually cure MRSA. Drug-resistant staph infections, also known as MRSA (methicillin-resistant Staphylococcus aureus), can cause a range of medical problems and even lead to death. 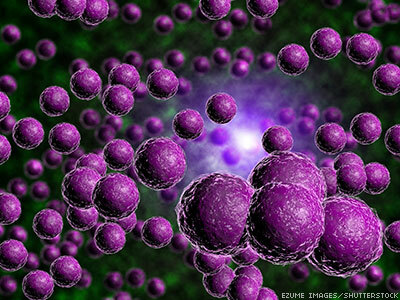 “MRSA infections kill 11,000 people each year in the United States, and the pathogen is considered one of the world's worst drug-resistant microbes," says Gautam Dantas, an associate professor of pathology and immunology at Washington University School of Medicine in St. Louis. Most frequently picked up in hospitals, the highly infectious pathogen is particularly dangerous to those with compromised immune-systems, including people living with HIV or HCV. Worse, they are incredibly difficult to fight because these infections aren’t susceptible to current antibiotics. Or at least that’s what doctors have thought. But now researchers have found a way to kill the deadly bacteria using those very antibiotics. The trick is using a combination of three antibiotics at once, which has been successful in test tubes and laboratory mice. Researchers say they are confident the same strategy will work in people. "Using the drug combination to treat people has the potential to begin quickly because all three antibiotics are approved by the FDA," says Dantas, the lead author on the study, which was published online in the journal Nature Chemical Biology. The three prescription medications, meropenem, piperacillin and tazobactam, are from a class of antibiotics called beta-lactams that haven’t been effective against MRSA for decades. Like HIV, the MRSA bacterium has mutated frequently and has become immune to even the toughest antibiotics available today. Dantas' team, working with collaborators at Barnes-Jewish Hospital in St. Louis, tested and genetically analyzed 73 different strains of MRSA to represent the range of hospital-acquired and community-acquired forms of the pathogen. Then they treated the MRSA microbes with the three-drug combination. The treatments were one hundred percent effective. Furthermore, experiments conducted by additional collaborators at the University of Notre Dame, have shown that the combination therapy cures MRSA-infected mice. "Without treatment, these MRSA-infected mice tend to live less than a day, but the three-drug combination cured the mice," Dantas says. "After the treatment, the mice were thriving." Although the drugs, which work by attacking the cell wall of the bacteria, have been ineffective alone, together they are capable of knocking down that wall. In the studies so far, the three-drug combination hasn’t produced further drug-resistance in MRSA. "This three-drug combination appears to prevent MRSA from becoming resistant to it," Dantas explains. "We know all bacteria eventually develop resistance to antibiotics, but this trio buys us some time, potentially a significant amount of time." Dantas' team is now investigating whether this same combination-tactic could work with other antibiotics, and other bacterial pathogens. "We started with MRSA because it's such a difficult bug to treat," he said. "But we are optimistic the same type of approach may work against other deadly pathogens, such as Pseudomonas and certain virulent forms of E. coli." All of which is good news to those with compromised immune systems; and pretty much anyone who has to spend time in a hospital.